Last week, Team Fink went on a poverty walk hosted by Network Coffee House as part of their Power of One inquiry block. It was an incredibly eye-opening experience that built empathy and community. Below are student reflections of the day. Angelina B- We are so quick to judge others, but have we ever put our selves in their shoes? 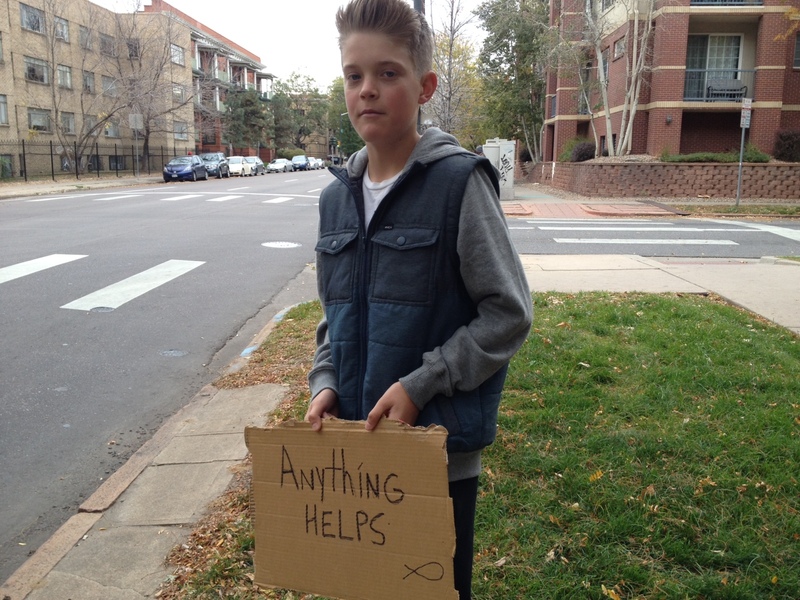 When we see someone on the street corner holding a sign for money, what is your first thought? All they want is money for drugs. They just dressed up like that to get money. Society tells us that homeless people are bad, scary, lazy. But have you heard their story’s, why they did what they did. We act as if we haven’t done anything bad in our life. We held up a sign that says, ” Anything helps.” I got dirty looks from people in there car, not one person in their cars looked like they cared. We did get one dollar from someone, but that person wasn’t in a car. It was a homeless man who gave it to us. The person I would not think to give me anything was a man who was homeless. I had only herd things about the homeless that people have told be about them. The bad things they do, stealing, hurting others, braking things. We only see their 10% and don’t try to look for their 90%. We are so quick to judge others, but have we ever put our selves in their shoes? Izzy- Today we went on a poverty walk at The Network. It truly was an amazing experience. Even bad experiences can be used for good. Fear can transform into lessons. I especially liked holding the sign, because it showed me how we are. How we just go on with our lives and not pay attention to who and what is around us. Even the people who have nothing are willing to give. The walk put us in a vulnerable position, but it is good to out yourself into other people’s shoes. Stereotypes disappear when you become part of it. It doesn’t seem so strange anymore, just different. Angelina H- The poverty walk opened my squinting eyes to the world of poverty surrounding me. The most impactful thing was holding the sign up. People just looked at me, and kept going. I was really put into the shoes of someone who is forced to do that. Watching other people, and praying, and learning, was all a new and amazing experience. Being upper middle class, and still looking around to make sure I was safe, I couldn’t imagine what being homeless would feel like in that situation. Macie- This experience opened a new lens of humility and empathy into my life. The assumptions that we have for the homeless are not all true. 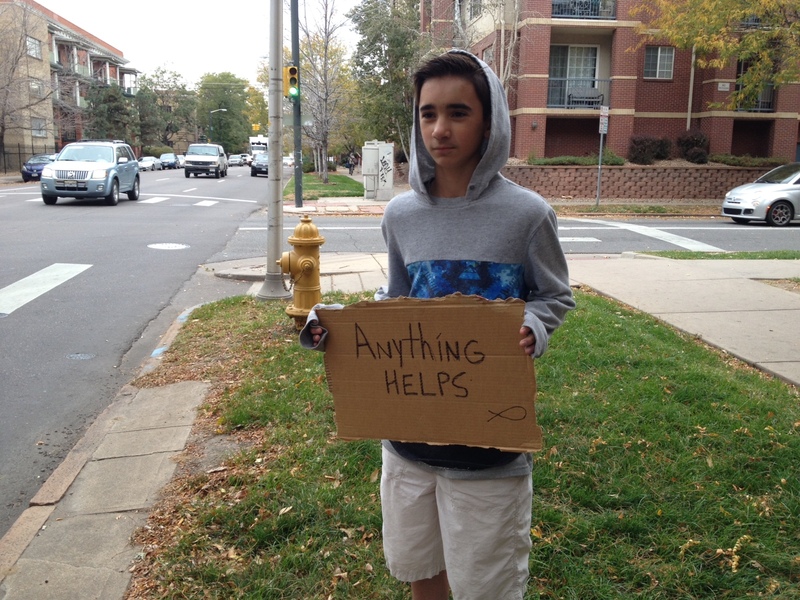 I met some giving homeless people who don’t have as much as we do. We were only out there observing for about an hour, but it happens everyday around us. We have so many opportunities to help, but we are too lazy. Like the video we watched this morning showing that one person can make a change can make a difference. Just one drop of love can overflow the sea. It only takes one person to recognize that not all homeless people match up to who we think they are. One man showed his kindness through asking us how our day was and took the time to talk to us. Today I held a sign on the side of the road and a woman who drove by started cursing and yelling in her car toward me. Why do we have such a stern, hardened heart towards people who need a little love? If we were thrown out in the streets after being in our warm, comforting homes, I bet we would never walk past a homeless person again and feel disgust and assumption in our hearts. We are in our own personal bubble filled with possession and money etc. The homeless popped that bubble and have been through experiences that we would never dream of while we are wrapped in our cozy blanket sitting next to a fire. We are all interconnected so why not help one another.